Thanks in no small part to coverage from local radio and newspapers in the area, what was conceived as a Bristol Lodekka running day turned into something on a rather larger scale with an array of 15 buses and coaches of local interest providing thousands of free rides on four services around the streets of Norwich. Additional vehicles formed a static display at County Hall which was the centre of the day’s well organised operations. 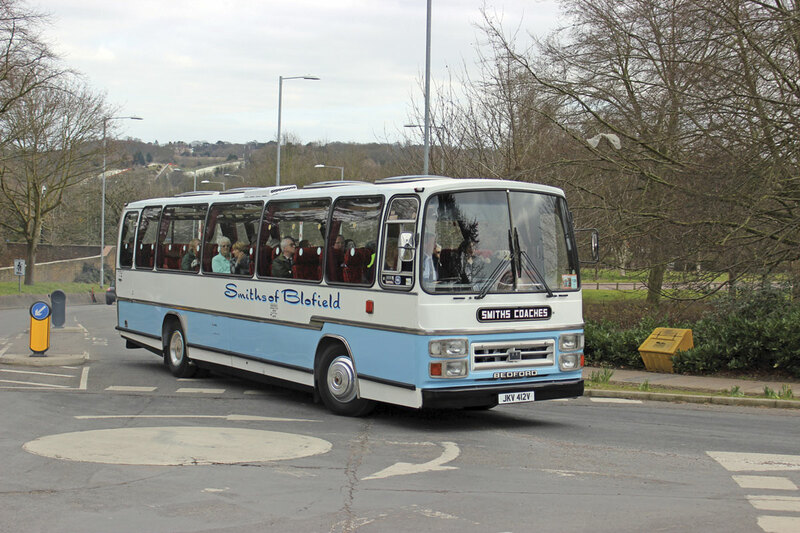 Rebilled as a Classic Bus Day, it saw buses depart from the railway station, Castle Meadow and County Hall every 15 minutes, with many departures requiring the provision of duplicates. 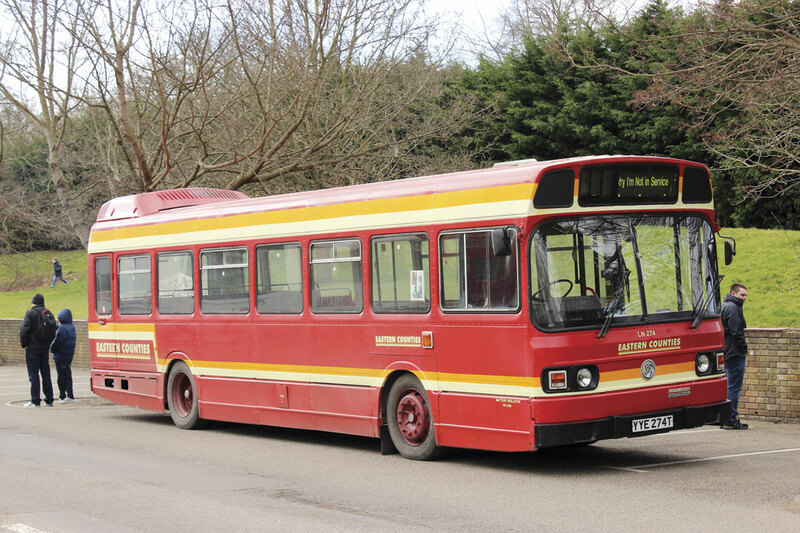 The aim of the proceedings was to hand out leaflets and hopefully attract members of the public to visit the Ipswich Transport Museum and the East Anglia Transport Museum (EATM) at Carlton Colville, near Lowestoft, during the coming season. 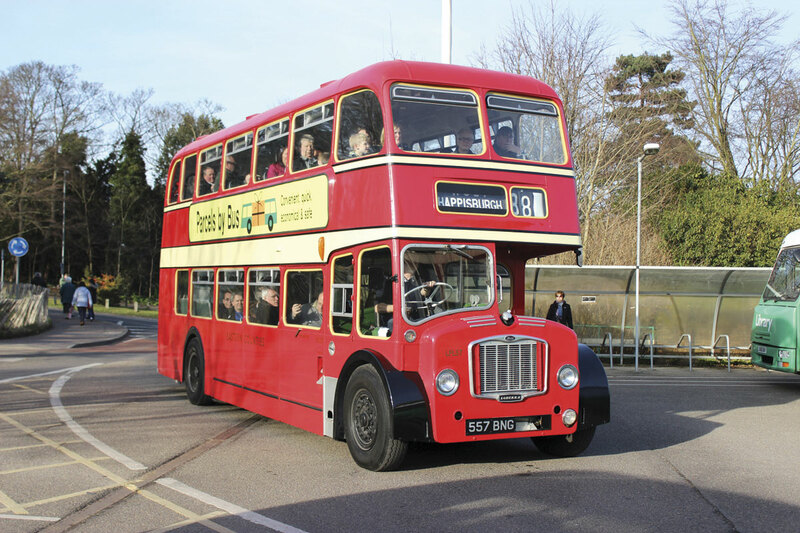 The Eastern Transport Collection also provided vehicles from its collection while First Eastern Counties joined the party in a big way, not only supplying two buses to perform on the road, but also opening up its Rowntree Way maintenance depot for guided tours that attracted full busloads of passengers. First’s wholehearted support included the posting of colourful posters on its buses. Chris Speed, Business Manager at First Eastern Counties, told me that they had been asked to help with arranging the event with the Council and particularly with Health & Safety aspects. The Council had wanted to see one of the main local operators involved. 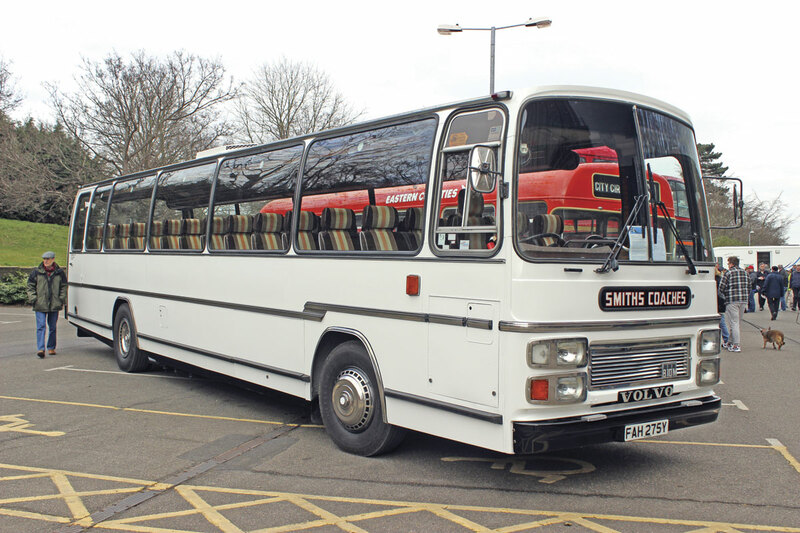 Although the advertising material promised ‘a selection of buses from the 1940s to the 1990s’, in practice First brought the line-up into the 21st Century by sending a DDA-compliant 53-plate Volvo B7TL Alexander ALX400 to ensure that everyone would be able to join in. 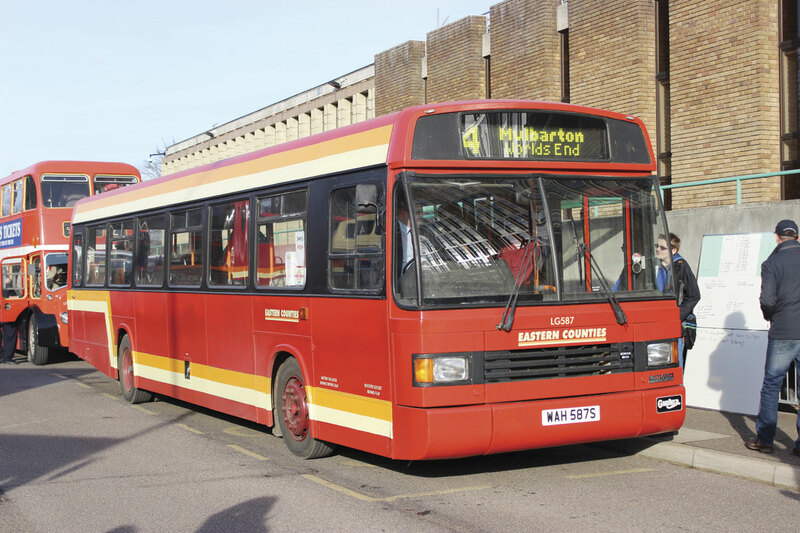 The bus in question carried the predominantly red livery of 1987 which had been chosen by the drivers and engineers of Ipswich depot where it is based. 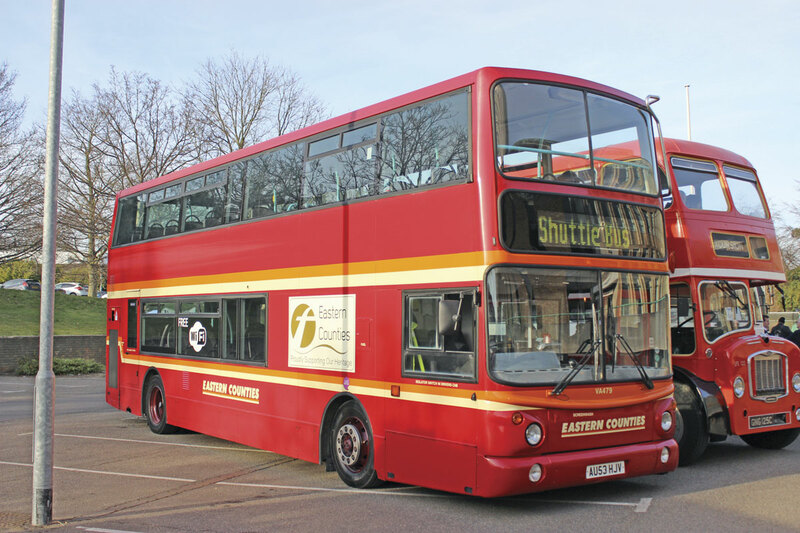 First is enthusiastically embracing the heritage livery concept, also running buses carrying the Lowestoft Corporation maroon and cream colours and the former Great Yarmouth blue and cream. 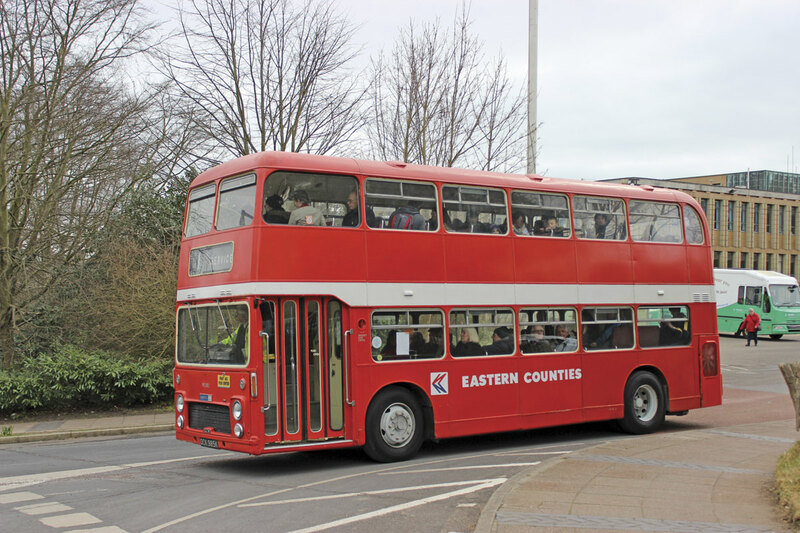 Later in the year there will be another Eastern Counties heritage livery that will be chosen by the drivers and engineers of Norwich depot. 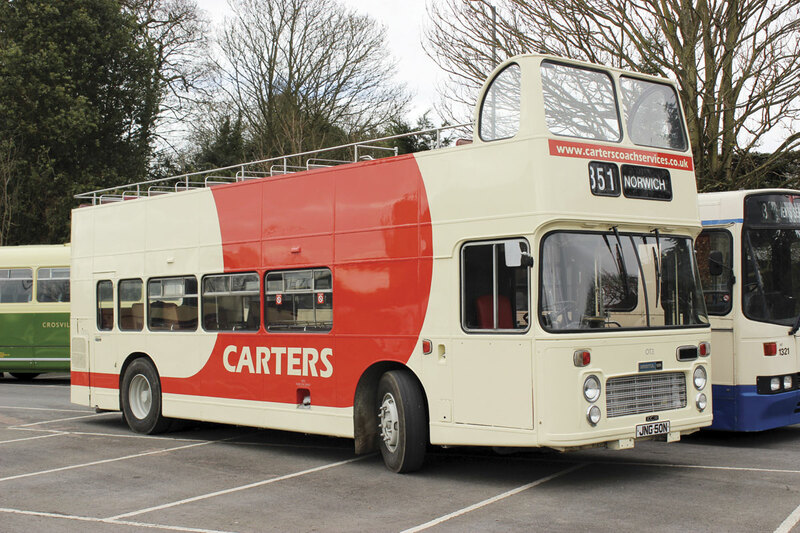 Operating alongside the Volvo was an AEC Routemaster RML carrying Eastern Counties’ colours from First’s private hire fleet. Private operators also played their part with several sending along coaches, among them Smiths of Blofield with a Bedford Plaxton Supreme, Norfolk Roadways with two mid 1980s Plaxton Paramount 3200 Bedfords and Peelings of Tittleshall with their newly repainted Plaxton Supreme bodied Volvo B10M which had yet to have its vinyls applied. Carters sent along their very smart Bristol VR ECW open topper. 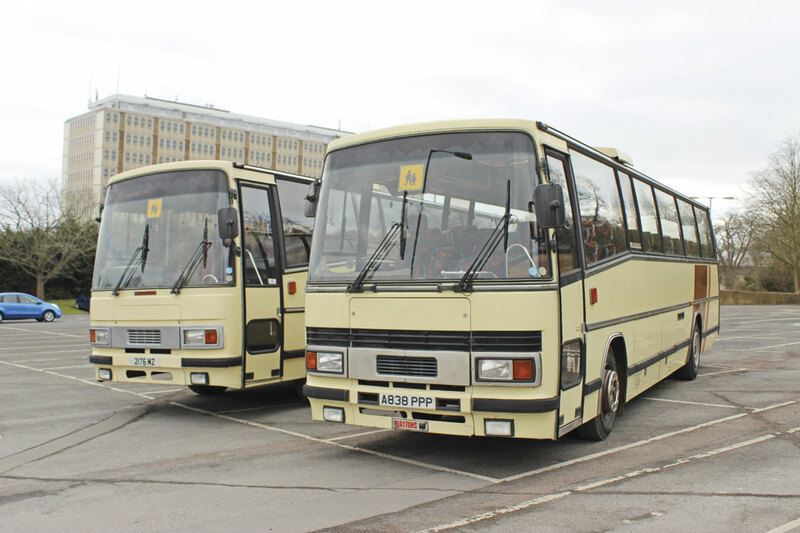 Though all played their part, the mainstay of provision was vehicles from the local fleets, particularly Eastern Counties, many of them combining the products of Bristol and ECW. 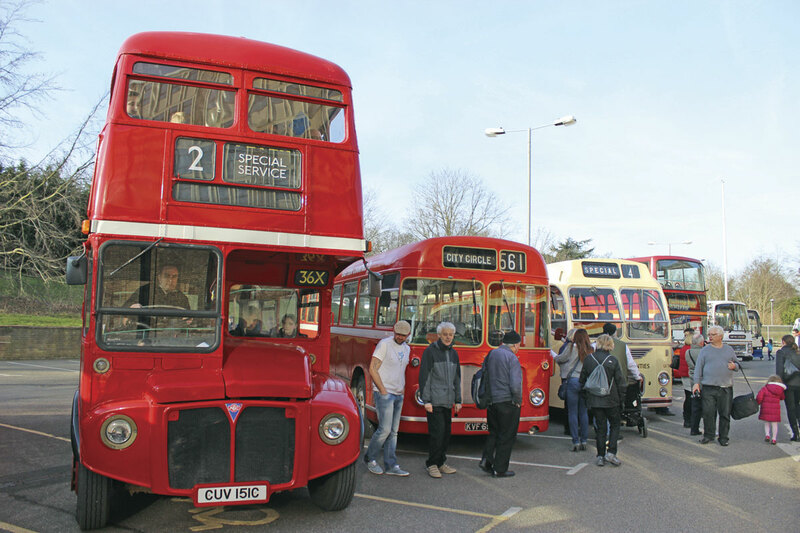 Types represented included the Bristol VR, RE, MW, Lodekka, and the oldest buses present, a 1949 Bristol K5G and a Bristol L of the same vintage, the latter recreating the former Eastern Counties service13A/B to Costessey from St Stephens Street. 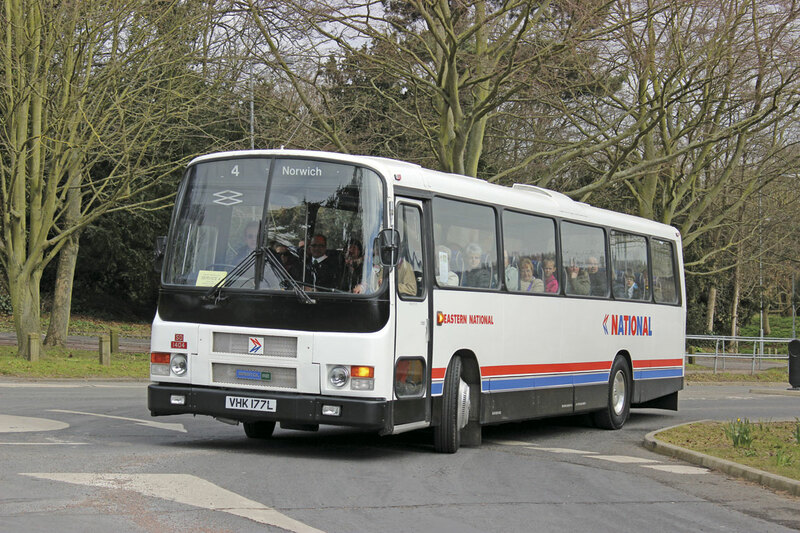 In the same colours as the Volvo B7TL were both a Leyland National and a National Greenway. In most respects, the County Hall site, easily accessible off the A47 and with generous car parking available, was ideal, providing a fine makeshift terminus and layover area though toilet provision was a major omission and some felt the absence of catering facilities of any kind was disappointing. Generally bright, if cold weather brought crowds out in numbers that greatly exceeded those anticipated and I understand that thought will now be given to turning this one-off into a more regular calendar date. I can’t tell you how wonderful The Ipswich Transport Museum and the East Anglia Transport Museum at Carlton Colville are because I’ve not been to either yet, though they are firmly on my weekend to do list. Following Sunday’s promotional efforts, one hopes that many more people will be aware of them and planning a visit.